Follow This Plan To Turn £100 Into £1,000 In 2 Months! Fantastic news! You can reach £1,000 even faster than you can with the 'starting with £25 guide' - however, if you can't afford to start with £100, check out our other 'Starting with' guides here, Which Plan Should I Follow. You can start making profit today. In your first week, you will make £50 profit risk free. From the second week onwards, you will make between £50 to £100 each depending on the advised Welcome Offers. Easy money! Again no problem! Just skip their Welcome Offer and move on to the next Welcome Offer. You can always keep an eye out on Daily Offers by signing up to OddsMonkey for offers for accounts you already have. Our job is to make you money! Jon and Sarah are available on Live Help, 7 days a week. Should they be offline at any point, just leave a message and they will reply within 24 hours (usually much sooner). Could I start with more than £100? Sure no problem, if you have more funds to invest initially into matched betting, you can complete more Welcome Offers at the same time (more than 4 offers per week as outlined below), plus choose free bet odds greater than 4.0. 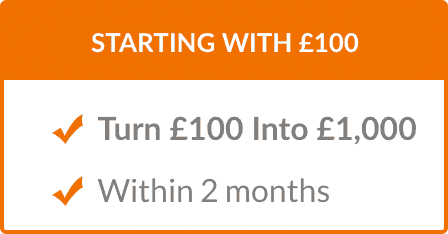 This means you can reach £1,000 sooner than 2 months. The Team Profit member record is 3 weeks to complete all the offers! We are showing with the Week By Week Plan that you can start from as little as £100 and still make £1,000 within 2 months from matched betting. Can I track my profit from £100 to £1,000? For your first week, complete the Coral, William Hill and Moplay welcome offers to make around £59 profit. Simply click on the Guide buttons in the table below. Deposit - £5 into Coral and around £50 into Betfair. Note Coral's minimum deposit is £5 with a bank card or £10 with Paypal. Free Bet Odds - To keep your Betfair Exchange liability below £50, for your £20 free bets choose odds between 3.5 and 4.0. If you need any help finding suitable teams, just check our 'Selections' articles or ask us on Live Help. This week you'll be doing a couple more easy offers in the form of Skybet and Betfred. After this it's a good idea to sign up and do the Smarkets offer as it's another exchange similar to Betfair, however the commission rate is lower at only 2%. Also you cannot lay bets from Paddypower off on the Betfair exchange as they are the same company, so in order to complete the Paddypower promotion next week you will need a Smarkets account. Free Bet Odds - Just check the amount in your Betfair balance whilst deciding the odds to choose for your free bets. You should be able to choose between 3.0 to 4.0 odds for your £30 free bets, which requires between £45 and £75 Betfair balance. This will make you between £18 to £20 profit. By now you should have made well over £150 and have a healthy balance to be able to tackle more offers! Week 3 has some more simply Bet X Get Y offers aimed at getting you over the £200 mark, which are extremely simple to do and you'll probably be able to complete them with your eyes closed now! (although I wouldn't advise it!). Week 4 will see you easily pass the £200 mark and beyond - great job! There's a fair amount of Betfair liability needed for the next week so you're going to focus here on finishing off some of the smaller Bet X get Y offers to boost your balance. If you have any money left in the bookies from this week, I'd recommend withdrawing it ready for next few week's offers. Congratulations on making over £200 profit! You should be sat around £250 profit at the moment, and some of you may have more if you were sent personal offers from bookies you've already completed. Now you're going to start completing the final bet x get y offers and move on to some slightly different types of welcome offer. You've probably passed the £300 mark now, or are very close. This is one of the most profitable weeks as you can finally tackle the extremely generous Bet365 offer! There's also a couple of "refund" offers that are slightly different than the Bet X Get Y as you only receive the free bet if your bet loses. We can still make a very easy profit these though! Make sure you have enough exchange balance before tackling the Bet365 offer - if you have made a withdrawal from your betting funds before hand then perhaps skip this and do it next week, or the week after. If you've been following the guide properly up until now then you will be fine completeing it and can make £70 from that offer alone, and over £130 this week! Please note: Refund are offers are so much easier with an Oddsmonkey subscription. I'd highly recommend using Oddsmonkey to help you complete these offers as they have the risk-free equal profit calculator. Week 8 is your final week of bookmaker sign ups. Some of you may need an extra week if you've had to delay one or two of the offers such as Bet365 so if that's the case then there's no need to panic - just take your time! After this week you'll have made well over £500 with some offers that are arguably even better to follow in weeks 10 to 13. Firstly, a huge congratulations on your progress so far. You will be sitting on over £500 profit (and potentially much more) from your first 8 weeks Matched Betting. You may be wondering what exactly to do next as you've signed up to all of the websites, right? So you've come to the end of Week 10 now and should have made around £500 from the Sports sign ups, £700 from Cashback offers and perhaps some more from reloads. Your bank should be well over £1000 from when you started with just £100! If you attempted a lot of the Cashback offers then you may still be waiting for some of the money to be tracked and paid and so your bank won't include the whole £700 ish from the Cashback sites just yet, however when the funds clear it will be. This can take up to a month, and in some cases up to a month and a half. Just be patient and you should receive it all! What do you do now? As explained in the Weeks 9 & 10, it's time to move on to Reload Offers. These will be your daily source of income. You've already signed up to the bookmakers, you've already signed up to the casinos via cashback sites - now its time to earn some consistent money from them; month in, month out.